The Virginia Department of Transportation (VDoT) admitted Monday it failed to meet its self-imposed goal of clearing all roads (primary and secondary) within 48 hours of a winter storm. To meet that goal, VDoT would have needed to have all roads cleared by midnight Sunday. They were still getting to secondary roads in Floyd County on Monday. Even worse, too may roads that have been scraped remain hazardous, covered with areas of solid ice from overnight freezes. 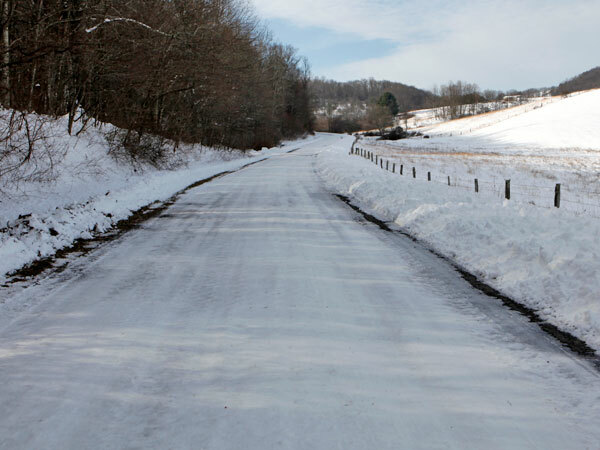 For some reason, VDoT crews neglected to lay down any chemicals or abrasives on hard-surfaced secondary roads so they remain packed with snow and ice. We’ve received a number of emails from county residents who say their roads are dangerous and, in some cases, still impassable. Temperatures over the next few days are expected to reach into the 40s so more of the ice and snow remaining on the roads may melt but lows in the 20s each night will leave some roads slick with ice. I know with gravel/dirt roads and surface-treated roads (tar/gravel) they cannot use conventional salt because it will destroy the roadbed itself. They can only scrape those roads, or use the liquid calcium chloride spray, which is primarily used as a pre-treatment on major roads. Our roads in Pulaski County had been regular pavement until this past summer, when they laid down a tar/gravel layer on top rather than re-pave. As a result, they only scraped our roads, late in the game, after neighbors had already taken care of it. They did not put down any chemicals. Why they didn;t at least lay down a layer of chip gravel for traction, I do not know. Our hard-surfaced secondary roads are a mix of surface-treated and conventional asphalt but none of the secondary roads that I traveled on Monday had any chemicals or abrasives on them. Some of the asphalt roads were patched this past summer with tar and gravel so that ruled out the use of salt. I didn’t find any non-salt abrasives used either. Could this be due to budget issues? With the so many cuts they might not have the money to use any salt ect on secondary roads. Not sure on budgetary issues, because most times the emergency snow removal budget for VDOT is a separate beast that they try to not short-change. However, because of several mild winters with well below average snowfall, that budget may have been cut. I was surprised that even on a lot of major roads, I didn’t see much in the way of any salt or abrasives, unlike previous years when it was obvious that salt had been applied. The only places I saw them for sure were bridges and the Route 114 construction area in Christiansburg.